This is the time of year to celebrate your admin, admin team, or virtual admin who works so hard for you and the company. Administrative Professionals Week is April 22nd through April 26th along with Administrative Professionals Day on April 24th. 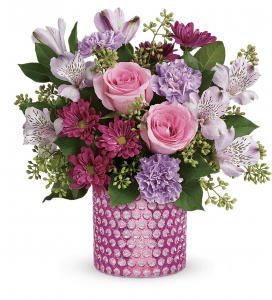 This gift for an admin offers a stunning bouquet that includes pink roses and lavender flowers like carnations, alstroemeria, and chrysanthemums that are displayed in a bubble-textured pink glass vase with a metallic finish. There are also seeded eucalyptus and lemon leaf. 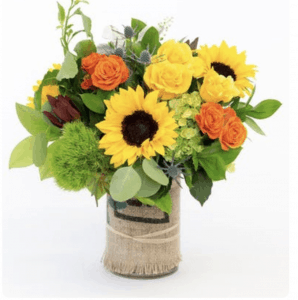 Burlap Chic Bouquet is an exclusive floral design that has sunflowers, orange roses, yellow roses, and a mix of seasonal flowers and greenery. These are arranged in a cylindrical vase with a burlap wrap. Give your admin this gorgeous flower arrangement made of hot pink roses, green cymbidium orchids, orange mini roses, and succulent cuts. These are all arranged in a leaf-lined glass cylinder. Your admin will enjoy displaying this garden basket on their desk or a table for years to come with just minimal maintenance. The round wicker basket has a purple African violet, yellow begonia, pink kalanchoe, and white hypoestes. This gift basket is perfect for that hard-working admin. It comes with many treats that they can enjoy at the office or at home. 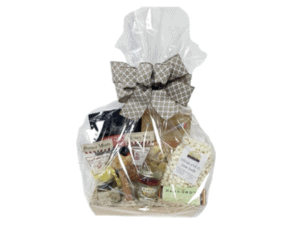 This larger gift basket is ideal if you have a team of admins. The savory and sweet snacks may include cheese, crackers, cookies, nuts, and candy. They arrive in a natural wicker basket. Place your order for Administrative Professionals Week today at our Rochester flower shop!